So today I decided to get serious about coming up with SOME sort of gift wrapping organization and turned to Pinterest for inspiration. Boy oh boy…did I find inspiration! 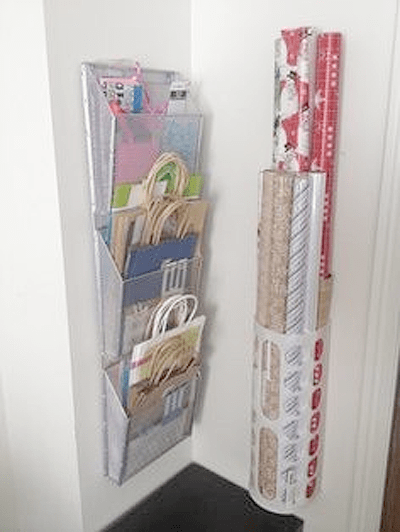 There are ENDLESS ideas on Pinterest for whipping your gift wrapping supplies into shape…but I had a few criteria in mind that eliminated a good percentage of them. I was looking for ideas that were fairly simple to set up, didn’t cost a fortune, and (probably most important) used creativity to solve this common household dilemma. I mean it doesn’t take a lot of creativity to have a team come in and design you a custom wall unit for your gift wrapping pleasure (which is what a lot of the big magazines offer.) 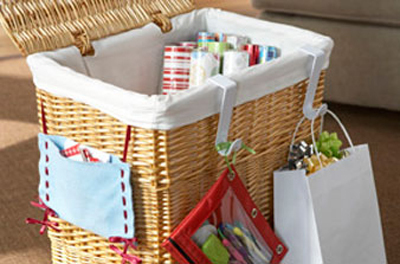 But it DOES take creativity to turn a wicker laundry hamper into gift wrap station extraordinaire! 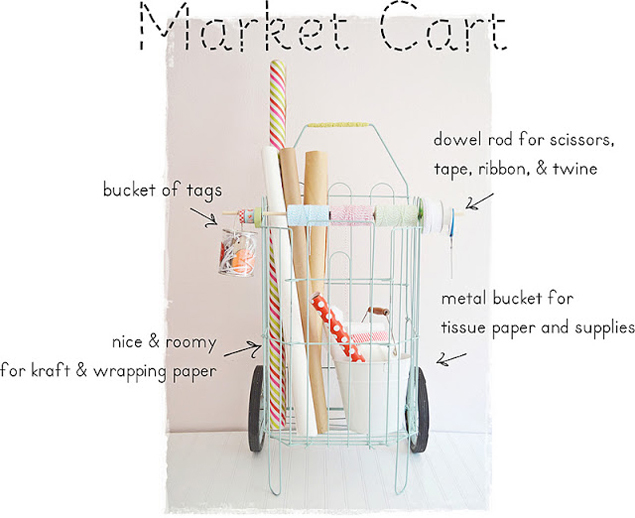 I love this unique idea of using a wicker clothes hamper as a wrapping paper storage solution! 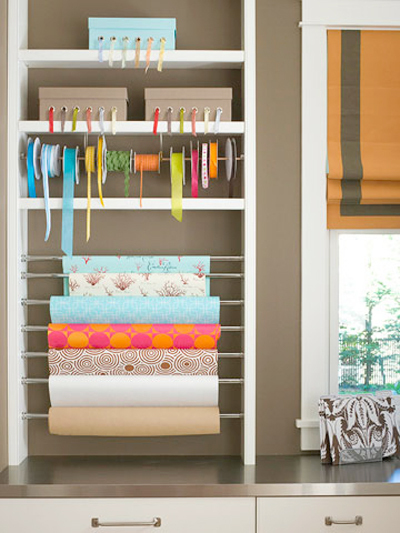 This rolling organizer can be kept in a closet and wheeled out when needed. 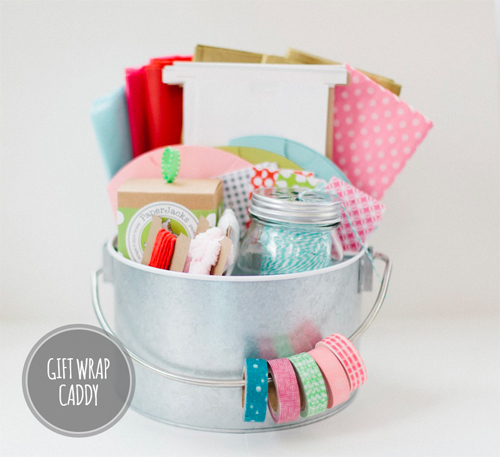 Be a holiday handy-man by turning a plastic bucket into a well-organized wrapping tool kit. 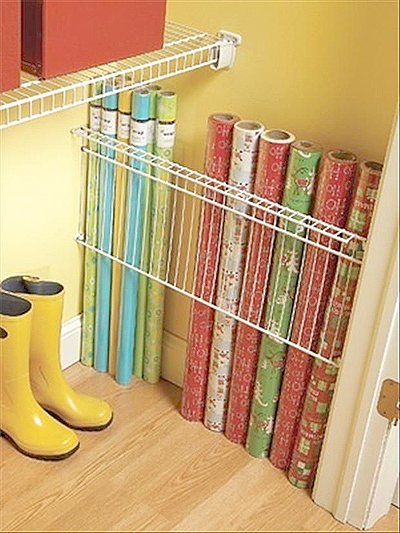 For just $20 and a trip to Ikea you can turn the unused space on the back of a door into a perfectly organized wrapping station. 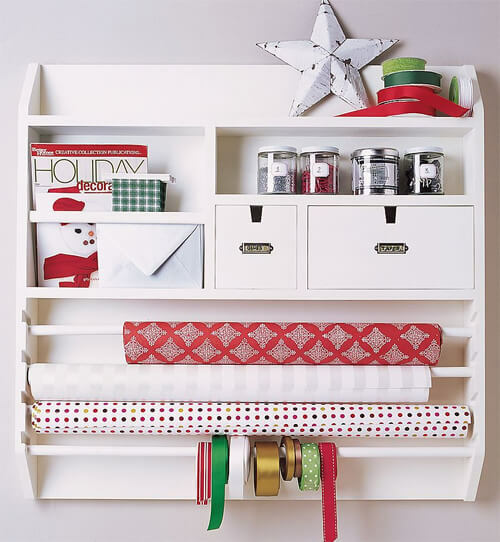 This over-the-door organizer has room for everything you might need for gift wrapping. Cute containers and jars keep labels, stickers, and tape organized too. 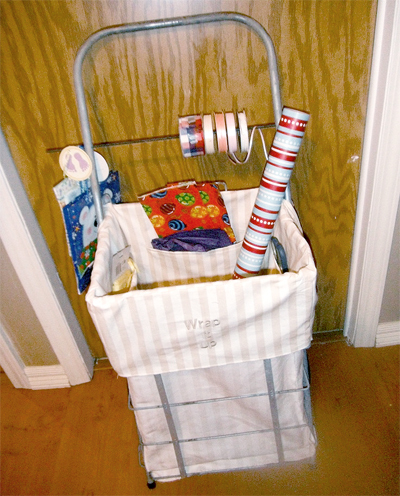 This cute fabric organizer can easily be brought out and hung on a basket or cart to use during the holiday season. 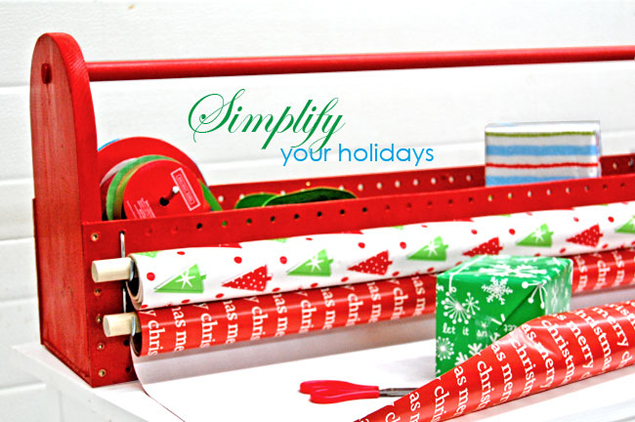 A handy gift wrap organizer tool box can dispense gift wrap right on your table top. 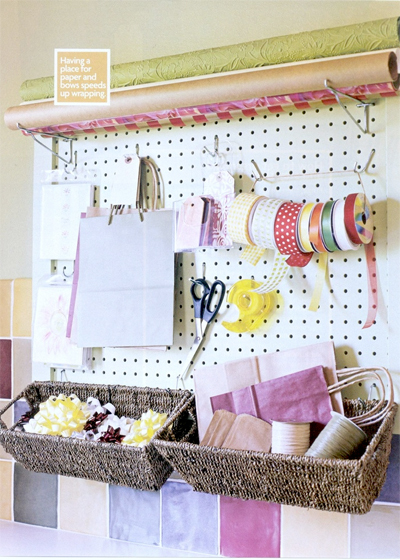 I really love this wall mounted craft organizer! It’s one of the few options I’ve included in this list that is simply something you purchase, but I like that it has everything you need in a nice compact space. 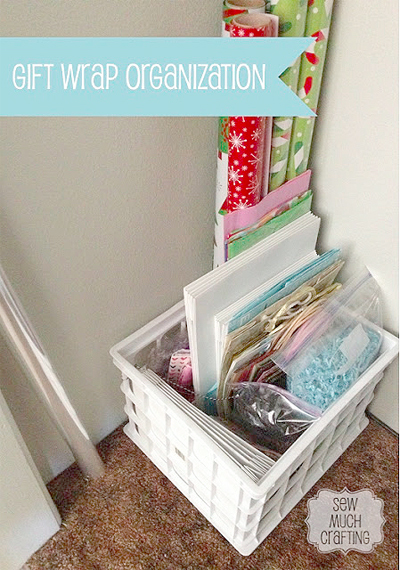 Getting organized doesn’t have to cost a fortune. This station was put together with only 3 tension rods and 2 wooden dowels! 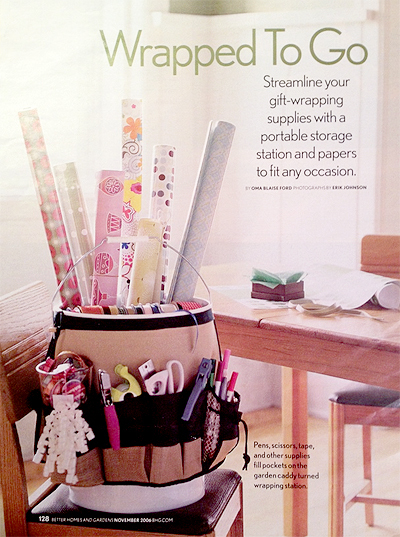 A gift wrap caddy will keep all your gift wrapping “accessories” organized, and would even make a great gift itself! 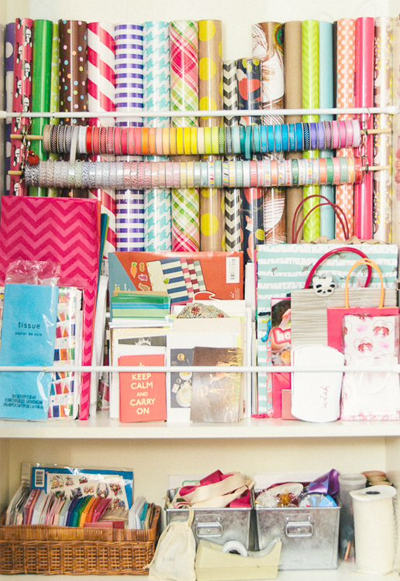 Most any unused space you have can be turned into a gift wrapping station. 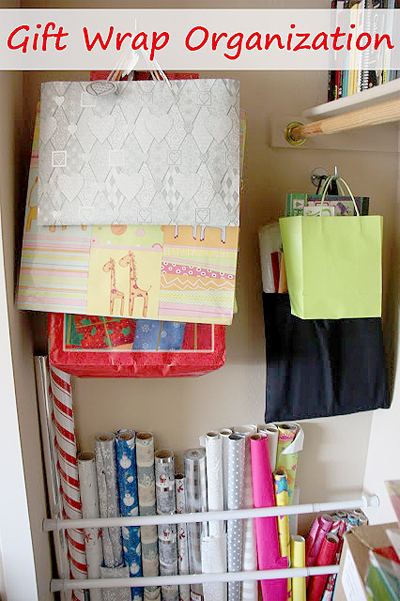 Here, a few unused drawers in an armoire hold all her gift wrapping supplies. 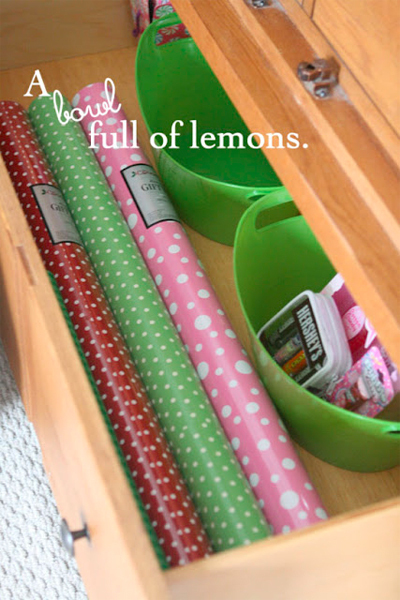 If you always end up hunting for the tape and scissors when it comes time to wrap presents, this idea is for you! 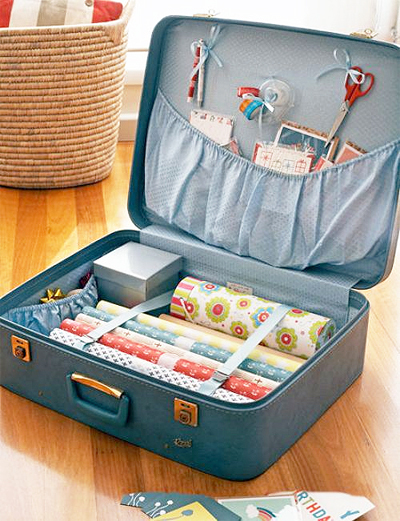 A repurposed suitcase can help you keep all the necessary supplies in one place. 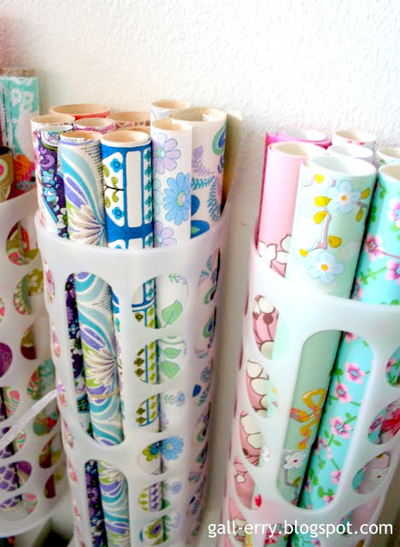 Such a clever use of tension rods and toilet paper holders! 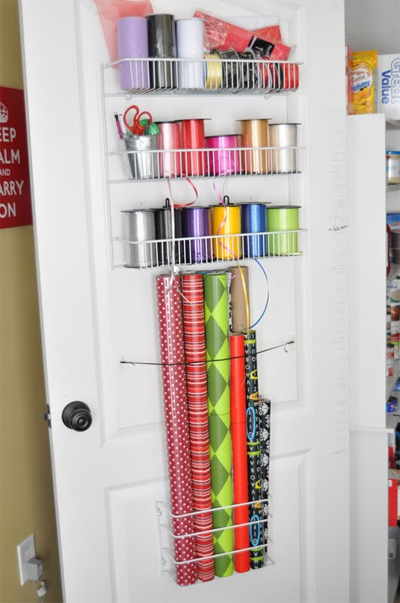 The perfect solution for small spaces – a hanging gift wrap organizer! 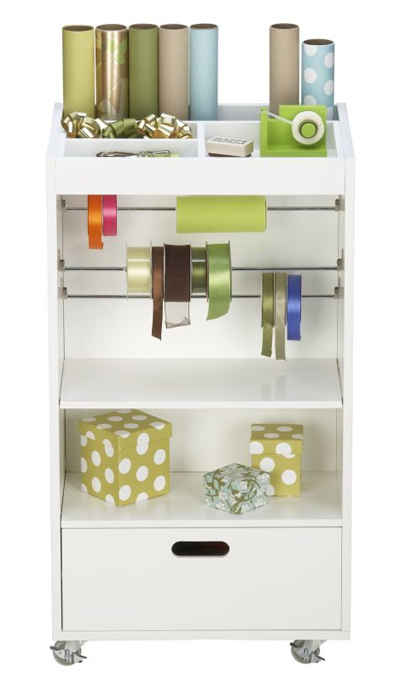 Another option for purchase, but it’s inexpensive and so handy for small living quarters. Turn a wire shelf on it’s side to utilize wasted closet space. So smart! 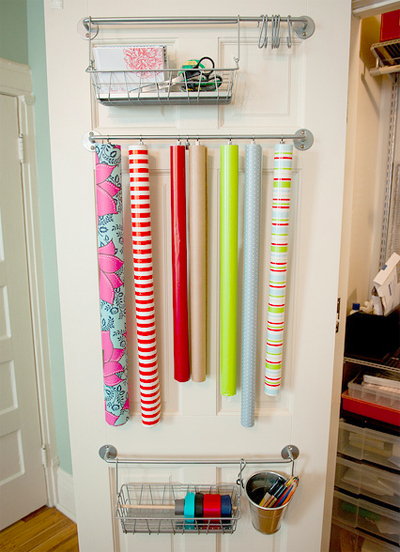 Another great back of the door solution – this time with inexpensive wire racks. One of the best uses of wasted space I’ve seen – string wire across a closet ceiling to store paper. Someone was definitely thinking outside of the box! 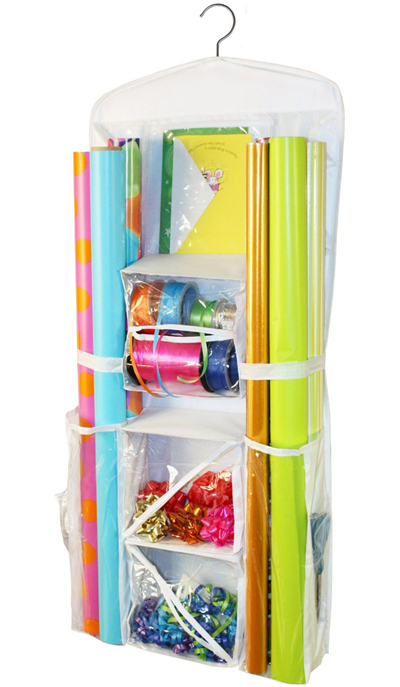 Have wrapping paper and ribbon right at your finger tips with this gorgeous wall mounted system. Very simple and fits nicely on a fairly small area of countertop. 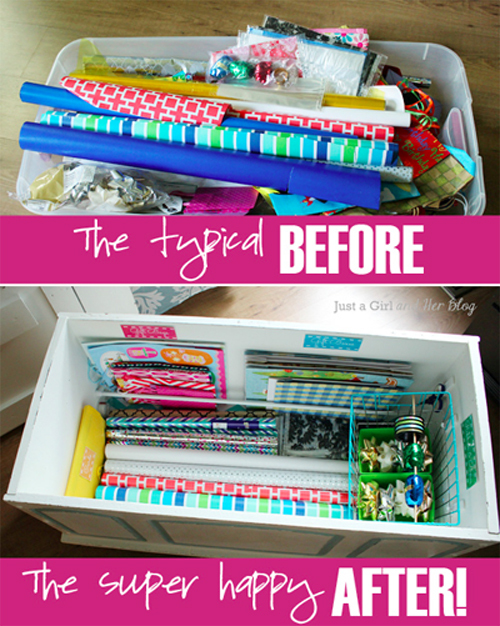 Try your hand at this DIY project that utilizes a thrift store trunk and keeps wrapping supplies out of site but still easily accessible. 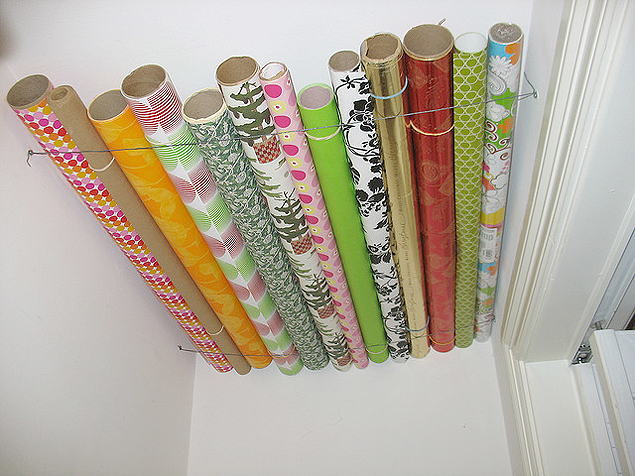 Use a few inexpensive plastic bag dispensers to organize wrapping paper by occasion. I don’t know about you, but I am pressing several of these ideas into service in my home TODAY! And not a moment too soon! At the rate my Cyber Monday shopping is arriving….pretty soon I’m not going to be able to walk in my office!